The ASPCA offers low-cost, high quality spay/neuter surgery on our Mobile Spay/Neuter Clinics that travel to many New York City neighborhoods! 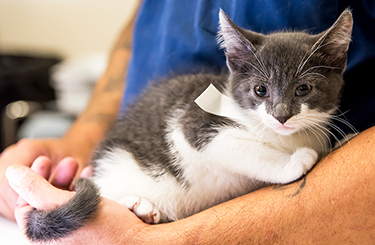 Recognizing that animal homelessness and many of the most serious animal health crises arise in neighborhoods with limited access to veterinary care, the ASPCA brings subsidized spay/neuter services directly to such communities. The ASPCA's Mobile Spay/Neuter Clinics are staffed with professionally trained, fully-licensed veterinarians and technicians. Our teams follow best practices established by the Association of Shelter Veterinarians. View our calendar for upcoming dates in your area. Does my cat or dog qualify for surgery on a Mobile Spay/Neuter Clinic? The ASPCA strives to make spay/neuter accessible and affordable for all New York City residents. Low-income pet parents in New York City's five boroughs with proof of public assistance such as welfare, Medicaid, Medicare, Supplemental Security Income (SSI), disability, food stamps, Temporary Assistance for Needy Families (TANF) or public housing qualify for heavily subsidized spay/neuter services for their cat or dog. Those receiving unemployment benefits do not qualify. Without proof of public assistance: $125 payable by cash, check or money order. Please make checks or money orders payable to “ASPCA." As part of the Animal Population Control Program, the NYC Department of Health & Mental Hygiene has partnered with the ASPCA to provide FREE spay/neuter for eligible residents on ASPCA Mobile Spay/Neuter Clinics in Manhattan, Queens or Staten Island. What services are provided for pets? Which animals will Mobile Spay/Neuter Clinics NOT accept for surgery? Doberman Pinschers without proof of a normal blood work test for von Willebrand factor, a blood clotting protein. Feral cats or animals in the care of an animal welfare or rescue organization. Click here to learn more about our spay/neuter services for rescuers. The ASPCA encourages New York City residents to spay/neuter all household cats and dogs. Residents are welcome to bring all pets to a Mobile Spay/Neuter Clinic location, but due to high demand for services, a policy of two pets maximum per household per clinic day MAY be applied. I run a local rescue group or humane society in New York City. Where can I bring my cats and dogs to be spayed/neutered? Spay/neuter surgery and transport services are provided for animal rescuers through our Stationary Spay/Neuter Clinic. The ASPCA's two NYC clinic locations provide high-quality spay/neuter services to dogs and cats managed by local animal rescuers only. Click here to learn more. Animals younger than four months old should eat a small meal at about 6:00 A.M. on the morning of surgery. Animals older than four months should have food removed at midnight prior to surgery. Do not withhold water from any animal at any time. Bring cats in carriers with one cat per carrier. What should I bring with me when my pet is admitted to the Mobile Spay/Neuter Clinic? Bring proof of public assistance (if applicable) and photo identification showing you are 18 years of age or older. If transporting a pet for someone who is disabled or elderly, bring that person's proof of public assistance and photo identification. What occurs when I arrive at the site of a Mobile Spay/Neuter Clinic? We suggest clients arrive at the location before 7:00 A.M. The clinic serves approximately 20-25 animals per day on a first-come, first-served basis until full. An ASPCA representative will arrive by 7:00 A.M. to assist with animal sign-in. Be prepared to wait approximately two hours for intake of animals. Please be prepared to pick up your pet at approximately 3:30 P.M. Pickup times vary, so check with the onsite ASPCA representative for actual time during check-in. While waiting, please be courteous and considerate of neighbors, fellow clients, and private property. Note: dates marked with a * have limited space.